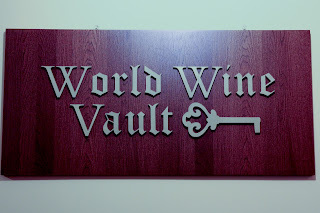 World Wine Vault, a relatively new wine retail outlet located at 22 Sin Ming Lane, #08-76, Midview City, Singapore 573969. I had the opportunity to meet its owners while visiting this place on 14 April, when it was having the Shaw Vineyard Estate wine tasting session. What started out as an online wine sales enterprise in early 2011 took on a physical dimension when the business moved into its current location in Nov 2011. This outlet is helmed by Ms Jaz Ong and Mr Joseph Chin, both owners of this wine venture. While there, I took the opportunity to view some of the wines on display. Most wines come from wine regions located in France, Australia, Italy, NZ and S.Africa. This outlet offers wines for both the 'price conscious' and the 'quality conscious' wine consumers. For the price conscious wine consumer there is a good selection of wines starting from $26 onwards. For those keen on easy drinking bubblies, there’s lambrusco at $26, a moscato spumante at $29 and a cremant at $37. These are affordable sips for daily drinking indulgence, bbq sessions and informal weekend get-togethers among friends where a generous quantity of wine at easy reach is looked upon favourably. 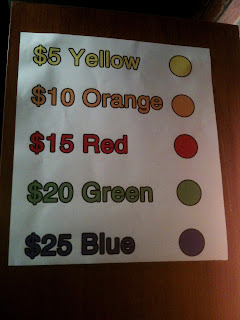 There’s a good range of whites and reds at prices between $30-$50 as well. These can be of interest to new wine enthusiasts who wish to taste wines from different countries without having to dig too deeply into their pockets. In particular, I saw some NZ pinot gris, pinot noir, riesling and gewürztraminer retailing at around $30; wines at good prices for those keen on exploring NZ wines or wanting to purchase a few bottles to pair with asian cuisine. For those into quality wines and respected labels, some wines over here to consider will be those from Ch Ausone and Ch Lafite Rothschild from France; Sassicaia from Italy; Mollydooker Carnival of Love Shiraz, Clarendon Hills Astralis, Grant Burge Meshach and Lake’s Folly Cabernets from Australia (to mention a few). If you are into purchasing wines in large sized formats, there’s wines from Haan Estate, Henley Farm, Irvine Grand Merlot, Colonial Estate and Oliverhill winery sold here as well. 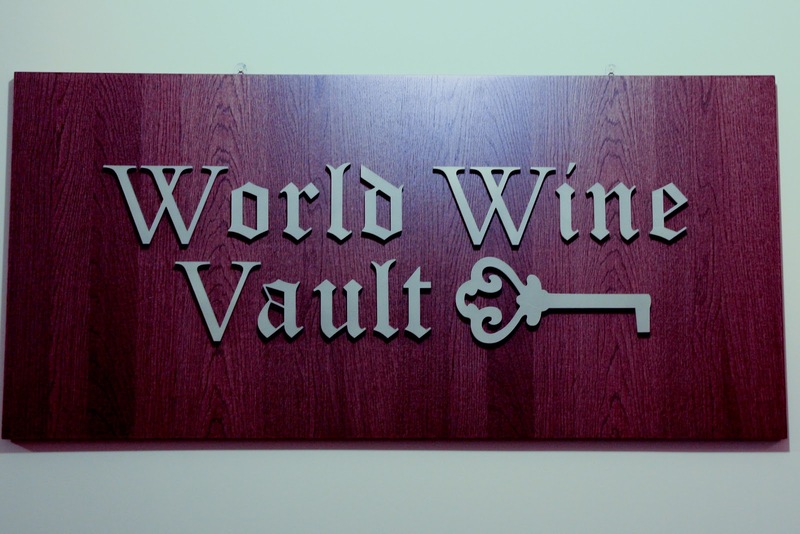 World Wine Vault organizes regular wine tasting sessions to give enthusiasts an opportunity to sample wines before purchase. On the other hand, you can also arrange for an exclusive wine tasting session for your friends at this place; the owners are accommodating. 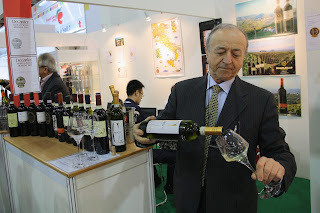 You can contact them via Tel: 6659368; www.worldwinevault.com and Facebook as well. Food & Hotel Asia (and the accompanying Wine & Spirits Asia) is one of the bigger shows held in Singapore once every 2 years. Visitors from other parts of Asia come over to source for products and equipments as well as to get a better understanding of what is out there in the global marketplace. Opened for stakeholders in the food and hospitality industry, it attracts quite an impressive crowd. Due to the response and the size of this show, it usually occupies all the halls in Singapore Expo. For this year, it is currently held between 17-20 April. I just attended the first 2 days of this show and spent some time visiting wine producers and merchants from Italy, Spain, Argentina, France and Australia. I have taken some pictures of this event and uploaded it at : FHA 2012 photo album. For the curious, do have a look :). 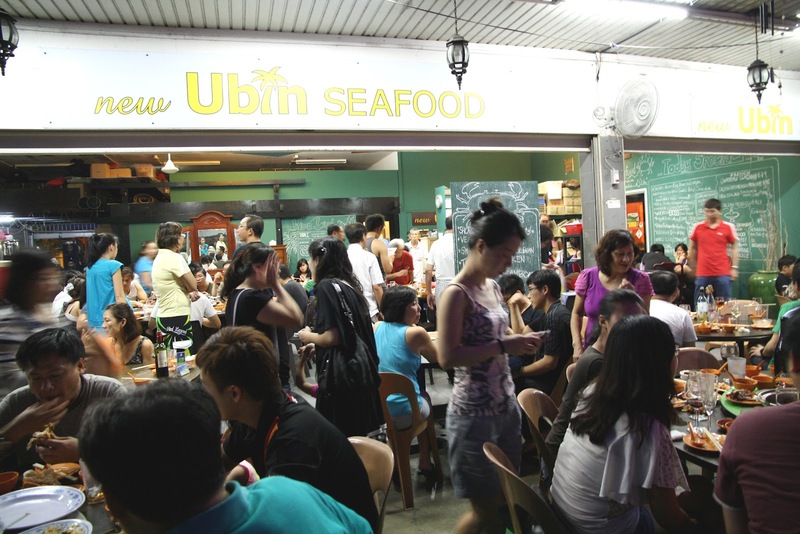 Residing in Bishan, Ang Mo Kio or Thomson and looking for an eatery to do ‘BYO wine’ dinners? 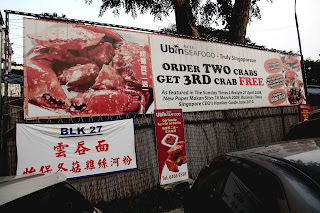 I recently came to know of New Ubin Seafood which accomodates BYO wines at no corkage charge. 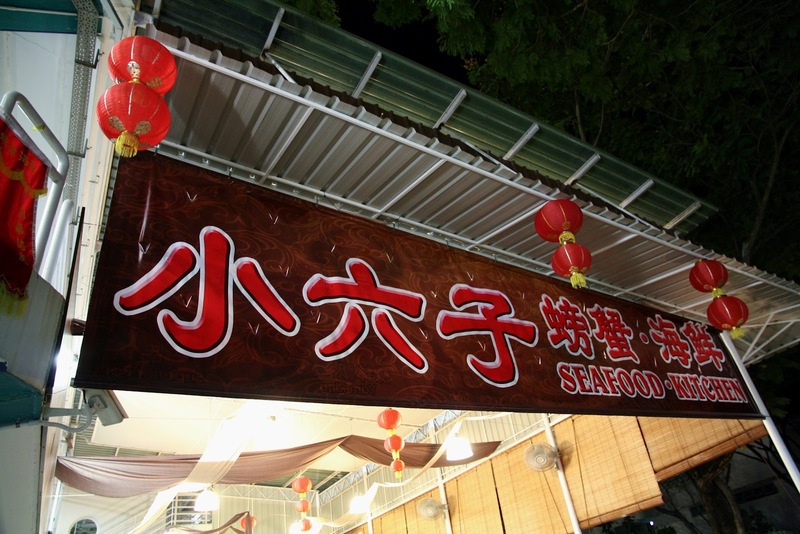 Its located at Blk 27, Sin Ming Road, #01-174, Sin Ming Industrial Estate, S(575680) Tel: 64669558; two bus stops away from Marymount MRT station. 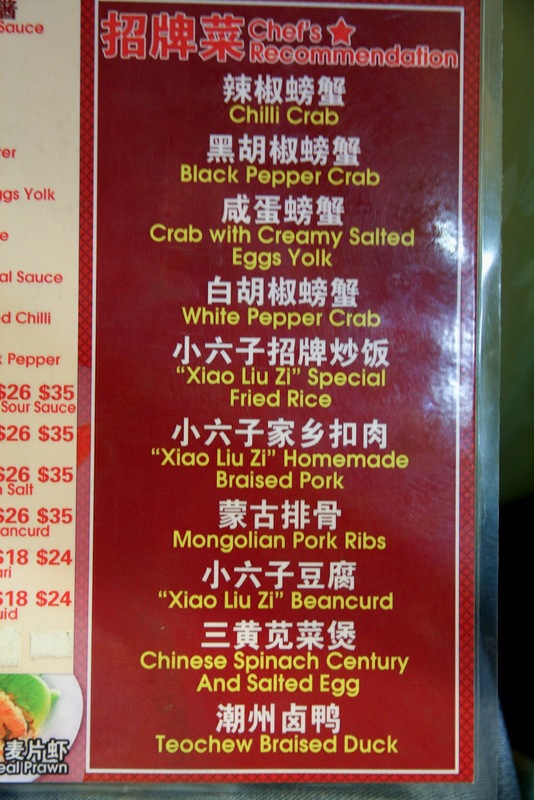 To look upon this place as a seafood eatery is certainly limiting its scope; it certainly offers a good range of meat dishes as well to excite one's taste buds. There’s 2 air-conditioned rooms; one a private room with 2 tables which can accommodate 20 diners, and a bigger room which holds slightly more than 5 tables. There’s also non-air con seating inside the restaurant as well as along the corridor. It’s an eatery which provides a laid back, casual setting for an informal and relaxed dining experience. Standard sized wine glasses which can be used for both white and red wines are provided by this establishment. To my pleasant surprise they readily offered champagne glasses as well when I brought out sparkling wines to chill :) Insulated cooler boxes which can easily hold 6 bottles are provided to diners to chill whites, sparkling and rose wines. I think this eatery provides a reasonable service to wine enthusiasts (and at no corkage charge at that). If you are into pairing wine with local cuisine, there’s sufficient dishes on the menu as well to keep you coming for more sessions. 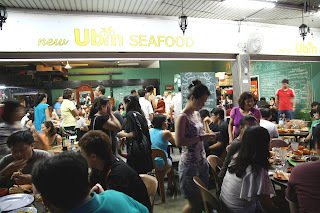 Some of the dishes we tried at this place can be viewed at the following link: New Ubin Seafood photo album. Dishes which made me smile and prompts me for a third visit are the fried small shrimps, salted egg sotong pieces, deep fried pork knuckle and the rib-eye with caramelized onion platter. Note to readers: I usually like to advise readers to give the eatery a call to check on their latest BYO policy before bringing your wines over. You should do so with this place as well, though I am fairly certain they are in no hurry to change their present policy any time too soon. Wine Universe recently held its official launch. 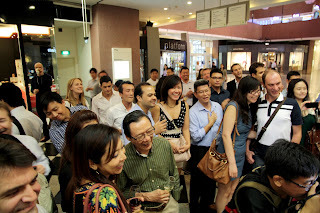 On 28 march 2012 a crowd of over 60 well wishers, guests and wine professionals gathered at this new wine retail outlet, located at #01-107 Millenia Walk, S(039596), to witness and celebrate its official opening. 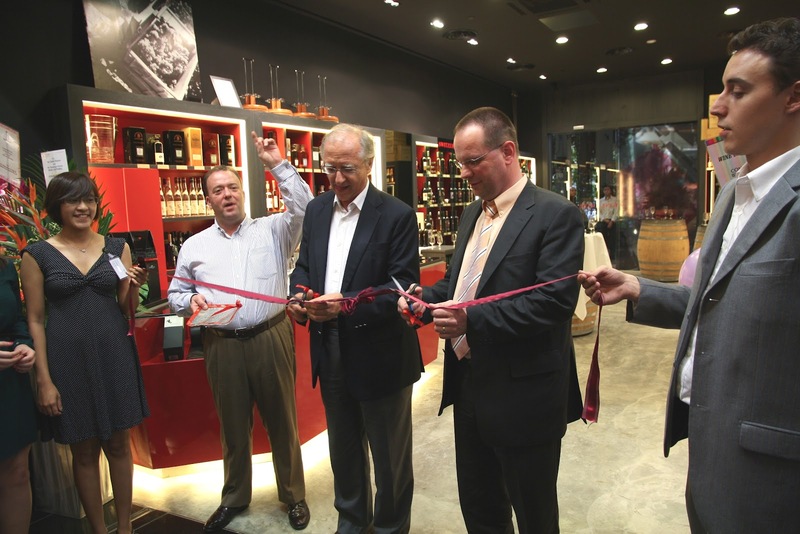 The Swiss Ambassador for Singapore, Mr Jorg Reding, was the guest of honour and took part in the ribbon-cutting ceremony together with this venture’s owners, Mr Dominique Giroud and Mr Claude Dizerens. I had the opportunity to meet Mr Giroud earlier in the afternoon during the Media tasting session to get to know a little bit more about the people behind this operation. Mr Giroud himself is a 5th generation Swiss vintner who wanted to do something more than produce Swiss wines. He began to expand his interest by setting up a wine retail outlet and a wine bar in Lausanne. The success of these ventures prompted him to set up a restaurant, Oenotheque by Wine Universe, in Singapore. Oenotheque’s wine cellar stocked a good range of wines from Europe as well as others from new world wine regions. 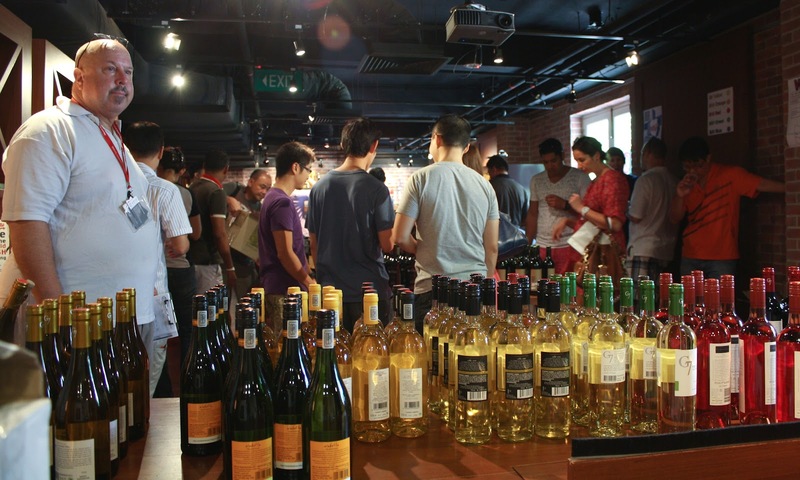 The success of this cellar prompted him to expand his operation in Singapore by setting up a full-fledged wine retail outlet to cater to growing demand and better serve local consumers. The local operation comes under the charge of Mr Claude Dizerens (managing director and co-owner of the local ventures). Day to day operation of this new retail outlet comes under the care of wine manager, Mr Axel Paquette. Ms Carina Ferreira is the latest addition to this team and she takes charge of sales and marketing. You can view the pictures via this link: Wine Universe photo album. 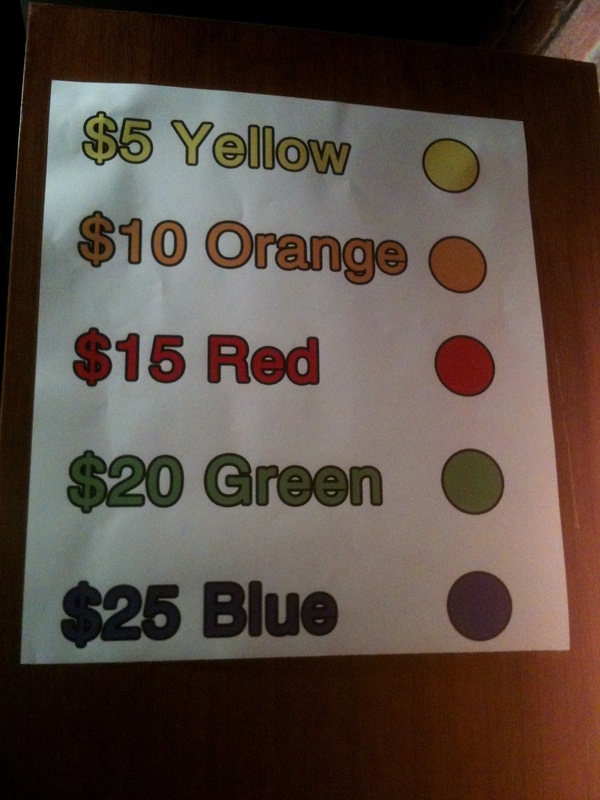 No need to refer to a price list each time you stand in front of a new label; just look at the colour of the sticker on a bottle and its easy to know the price. Wines sold were mainly from Italy, Argentina, Australia, New Zealand and Chile. Price does seem to matter to consumers. The sale started at 1pm and by the time I dropped by the place (at 1.30pm) wines sold at $5 and $10 were all snapped up! 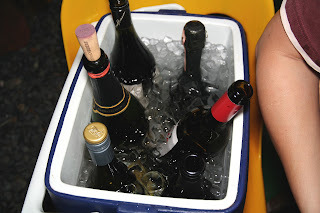 However even at $15/bottle onwards, there was a good range of bubblies, whites and reds on offer. 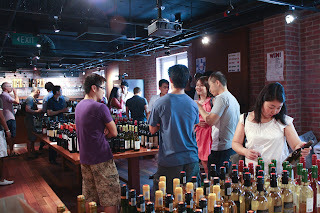 Wines put up for sale were offered for tasting as well, which gave consumers an opportunity to sample wines prior to deciding on a purchase. At the $25/bottle category there were some good deals to be found. Labels like 2003 Guerrieri Rizzardi ‘Villa Rizzardi’ Amarone della Valpolicella (Italy), 2009 Misha’s Vineyard The Gallery Gewurztraminer (NZ) and 2008 Misha’s Vineyard The High Note Pinot Noir (NZ) were snapped up in double quick time. I had the opportunity to speak to a few of the fellow customers while waiting for some friends to drop by. Some came to buy wines for informal gatherings with friends; they were looking for something easy to drink and those which wont hurt their pocket. A couple wanted easy quenchers as they drink wine daily. A friend of mine who swung by for this session was looking for wines to cook with as well. If you like to be notified of future tastings and sales at Rubicon Reserve Wines, just join its Facebook Page at http://www.facebook.com/rubicon.reservewines. A Chinese eatery which allows ‘BYO wine’ and does not charge any corkage. This relatively new eatery commenced operation 2 months ago. 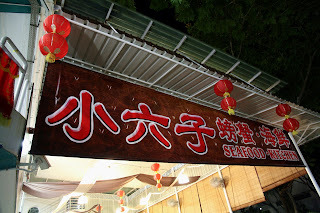 It's called Xiao Liu Zhi and is located at PH BRO Driving Range, 590 Toa Payoh East, Singapore 319134 (Tel: 62551512; next to First Toa Payoh Secondary School). I visited this place last night for a BYO wine dinner session with a group of friends. 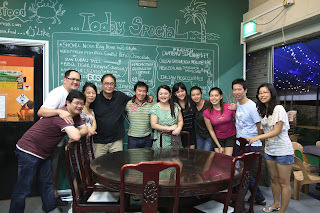 It’s managed by a Mr Tong Fu, who according to my fellow diners, is an ex-actor. Operating hours for lunch is between 11am to 2pm. Dinner is between 4.30pm and 11pm. The menu shows a good spread of meat, seafood and vegetable dishes; something to look forward to if you like to practice food and wine pairing with local cuisine. 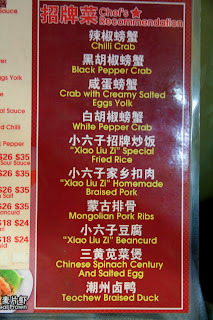 If you are curious about the dishes served here, I've uploaded some more photos at this link, Xiao Liu Zhi dinner. This eatery provides standard sized wine glasses which can be used for both white and red wine. They also provide ice buckets upon request for your whites, rose and bubblies. If you however prefer bordeaux or burgundy wine glasses, then you have to bring along your own glasses (something my fellow wine companions tend to do most times). Three dishes I particularly enjoyed during dinner were the pork ribs done with coffee, the braised duck and the braised pork belly pieces. Yes, I realize this is a 'seafood-oriented' eatery, but I have this guiltless affinity towards meat dishes :) The pork ribs with coffee influence paired well with the 2003 Amarone, the braised pork belly pieces with the 2008 SGM from Turkey Flat (Barossa) and the braised duck with the 2004 Faustino V (a reserva from Rioja). We had 4 whites at the table; a pinot gris from NZ, a muscadet from Loire, a frizzante style white made from pinot blanc and chardonnay blend from Venice, and a moscato from Lombardy. The clam dish (thankfully not hot with chilli-bits as I get in a few other eateries) paired well with Loire's muscadet as well as Lombardy's frizzante white blend. I must say the frizzante white stood well as a 'refreshing palate cleanser' when paired with most of the seafood dishes; the slight 'fizziness' it brings to the palate helps to refresh one's taste buds. The deep fried crispy prawns went well with the moscato from Lombardy (not too showy in its sweetness with good acid balance). The sweetness in the body of these prawns and the wine complemented each other, while the acidity in the wine helped to clear the palate of the oil from the deep frying process. I preferred the steamed fish head with NZ's pinot gris; no clashes here, the almost neutral flavour from the steamed fish collagen paired with the flavours of the pinot gris. 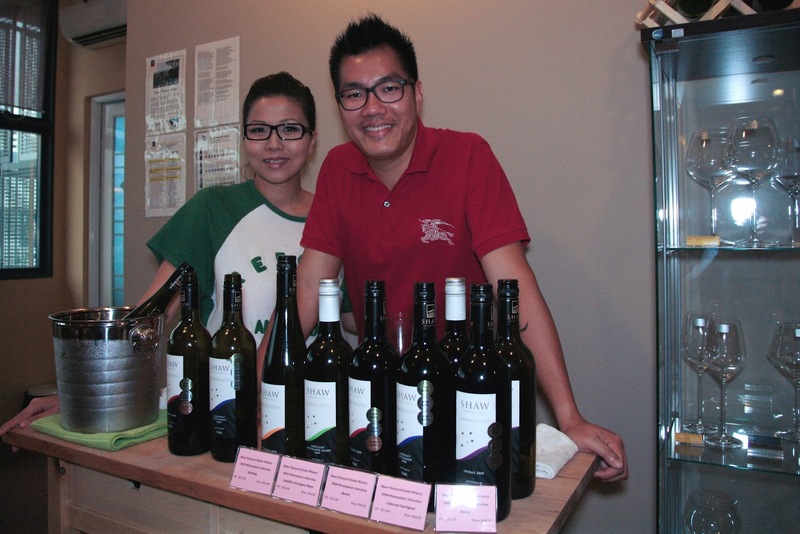 Check this eatery out if you are looking for a place in Toa Payoh to bring your wines to.